Click on the above categories for answers to the most frequently asked questions about organ and tissue donation and translplantation. Who is responsible for administering the Registry? Florida’s Agency for Health Care Administration selected Donate Life Florida as the contracted vendor to create the Joshua Abbott Organ and Tissue Donor Registry. 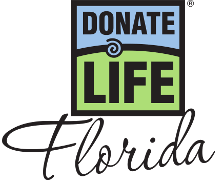 Donate Life Florida is a coalition of the state’s organ, tissue and eye donor programs. How can I be sure my information is kept confidential? Donate Life Florida adheres to the strictest and most up-to-date guidelines to keep all personal information confidential. Aside from standard information such as name and address, the only sensitive information we require is place of birth, while mother’s maiden name and driver license number are optional. How can I make a financial contribution to Donate Life Florida? We appreciate your interest in contributing to our efforts and helping people in need of organ and tissue transplants. Donate Life Florida, a non-profit 501(C)3 charitable organization, is dedicated to saving the lives of thousands of Floridians awaiting life-saving transplants. Your monetary donations are tax-deductible to the maximum extent allowed by law. Contributions may be made to Donate Life Florida, by clicking here. Thank you for supporting the effort to save lives through donation. Donate Life Florida!